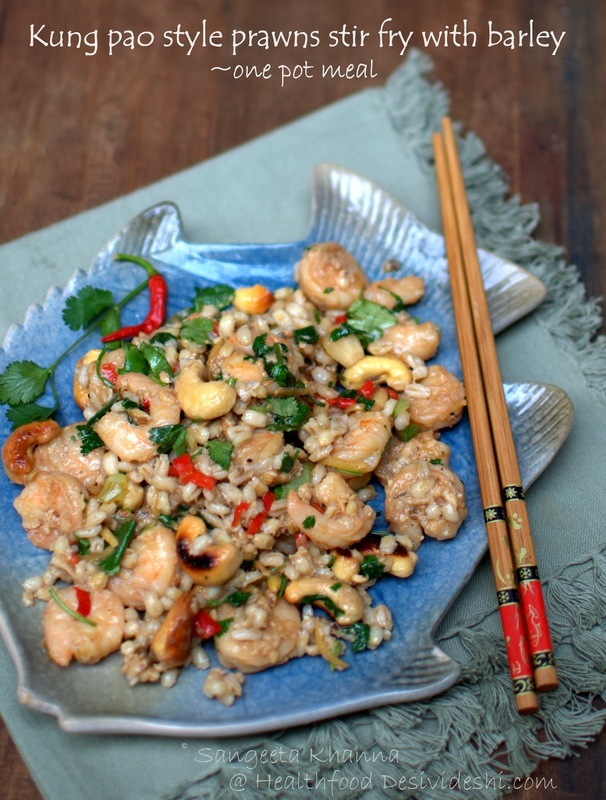 This prawns or shrimp stir fry with cashew nuts and pearl barley is a satisfying meal that gets ready in a flash if you have a well stocked fridge. I mean you should have some frozen shrimps, some boiled pearl barley and some fresh herbs for sure. A few sauces in your pantry help you immensely with such meals on the go. It takes about 15-20 minutes to put together this yummy meal and you might do it quicker if you have someone to chop the herbs and peel the garlic with you while you go chatting about the day's events. Happy meals have a start on the happy kitchen counters. Having said that, one pot meals are a relief for everyday cooking. Not necessarily the stews, soups or khichri type meals that cook in a single pot but I do make one dish meals that use different ingredients and and a few steps in the cooking process but come together in a single plate to be served as a one dish meal. So there can be many elements in thee same dish and I get an array of flavours and textures that I like in my food. Gourmet meals made simpler. The flavours are from Sichuan cuisine and kung pao is a variety of red chillies which gives a nice aroma and taste with combination of sichuan peppers. The same recipe can be created using chicken or tofu or even fresh cubed paneer if you want vegetarian options. Pearl barley can always be cooked and refrigerated for a week or so. Just pressure cook or pan cook just like you cook brown rice. It is better to start just when you thaw your frozen shrimps when using frozen. Add the marination just when you empty the shrimps in a bowl and let them thaw and marinate in the lower rack of fridge overnight or on the kitchen counter for a couple of hours. Fresh shrimps take about 20 minutes to marinate. The marination for the shrimps is made by mixing the rice vinegar, egg white, salt and pepper and a hint of sugar. Toss this mixture with the shrimp and let them rest for a while. Heat 1 tbsp sesame oil in a frying pan, coat the shrimps lightly with water chestnut flour* and arrange all the shrimps in the pan and shallow fry both sides for a couple of minutes. Cooking them for longer will make them chewy so take care of that. Drain and reserve. Now add 1 tsp of oil to the same pan and add the minced ginger and garlic and the sliced red chillies. Fry them for a few seconds till it gets aromatic. Toss and add the spring onions and coriander stems, add the cashews and let it all fry till the cashews get lightly browned. Add the barley, soy sauce and adjust seasoning with salt and pepper. Toss everything well till the flavours meld. 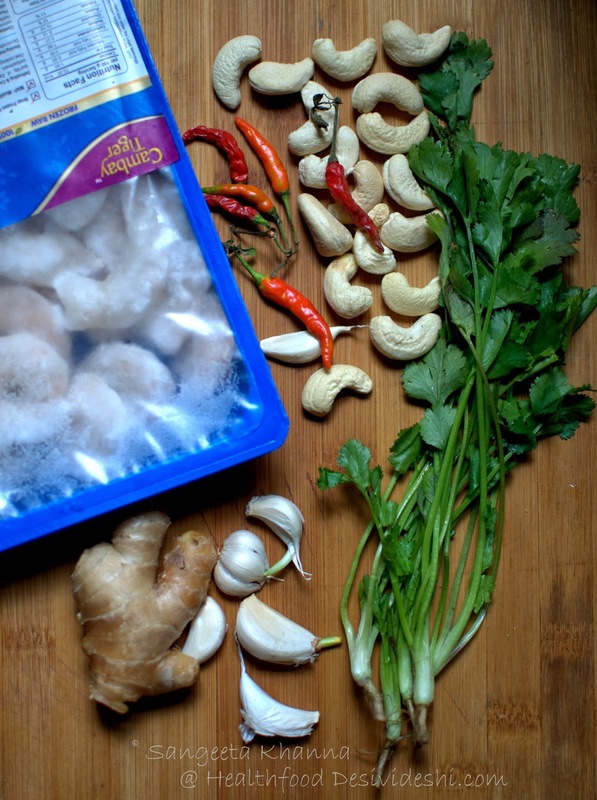 Add the shallow fried shrimps, toss well to mix and garnish with chopped coriander leaves. Serve immediately. 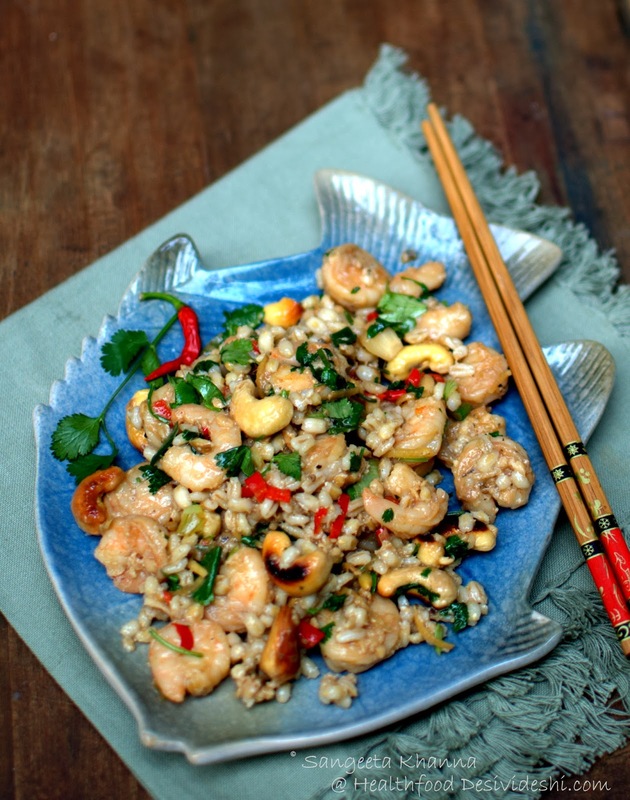 This kung pao style one pot meal with shrimps and cashews is richly flavoured. And the most interesting thing is, you get subtle flavours of water chestnuts* as I have used the flour to coat the shrimps. I love fresh water chestnuts in such stir fries and use them whenever possible, using water chestnut flour to replace corn flour is my way of bringing more flavors and skipping a refined (processed) flour in the recipe. Works wonderfully for me. Try that and see how you like it.